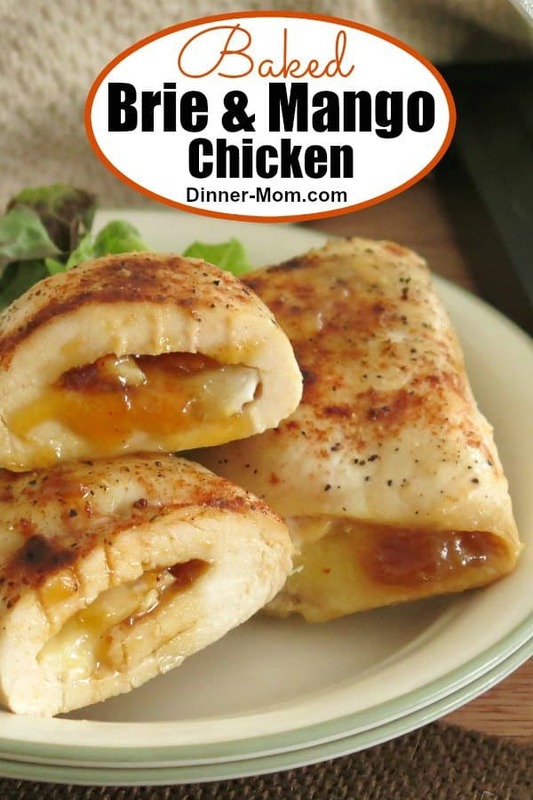 Mango Chutney Chicken and Brie Roll-ups use just 4 ingredients. Follow our tips to assemble in minutes and then sit back while it bakes! It’s a low-carb crowd-pleaser that’s perfect for special occasions! 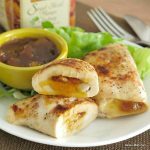 The simple combination of creamy brie and tangy mango chutney made this a very popular recipe at our make ahead meal kitchen! Assemble ahead of time and freeze, just like Chicken Asparagus Roll-ups. Or, enjoy it right away. Follow these tips for easy prep and dinner will be ready in no time. The chicken should be about 1/4 inch in thickness. Uggh. That’s me imagining that you are not excited about pounding chicken. Then don’t. Buy chicken “cutlets” instead. That’s my number one tip. Season chicken with salt and pepper. 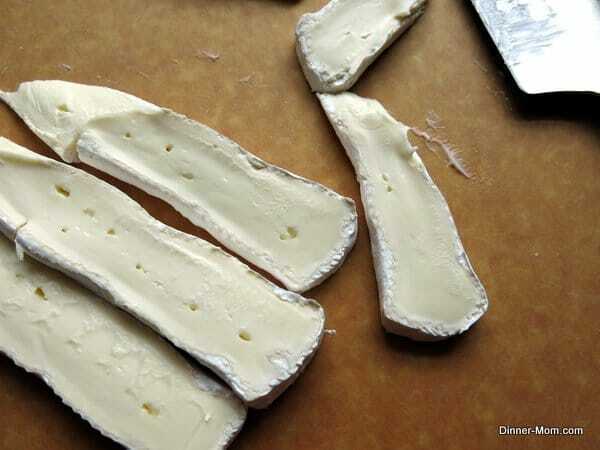 Cut the brie into slices about 3/8 inch thick..more than quarter, but less than half an inch. You can, but you don’t have to, remove the white rind on the cheese. It melts and mixes with the mango chutney in this recipe. It’s still on the strips in the picture above. If you want to remove it, then cut if off with a knife or scrape it off with the edge of a spoon before you cut it. Layer a slice of brie and a heaping teaspoon of mango chutney in the center of each piece of chicken. Roll up the chicken and secure it with a toothpick (which was not absolutely necessary, but I did it to be safe.) Sprinkle paprika over the top. Bake! Some of the sauce and cheese will ooze out. Spoon it over the top and serve the chicken with some more mango chutney on the side. I bought a small jar of prepared mango chutney and used the leftover amount to make Turkey Burgers infused with mango chutney. In case you’re inspired to make your own, I found a homemade mango chutney recipe over at Simply Recipes which looks very tasty. First of all, don’t bake anything! Prepare Mango Chutney Chicken roll-ups up to the point where cooking would begin and freeze the chicken uncooked. Place chicken in a single layer in a freezer safe container. Cover, label and store in the refrigerator for up to two months. When you are ready to enjoy this dish, defrost the roll-ups in the refrigerator and then cook according to the recipe instructions. 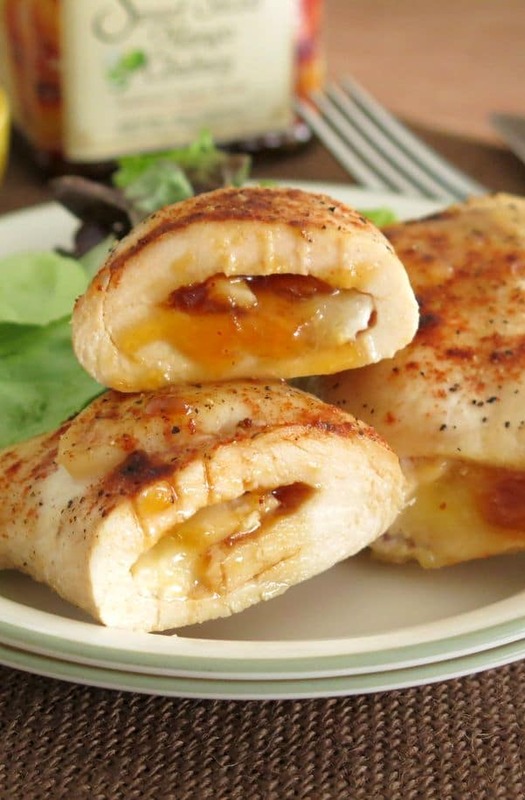 Baked chicken stuffed with mango chutney and brie is a crowd-pleaser with just 4 ingredients. You don't need to tell anyone just how easy they were to make! Lay chicken cutlets flat on piece of wax paper or plastic wrap. Cut brie into 6 slices about 1/4 inch thick and about the width of the chicken. 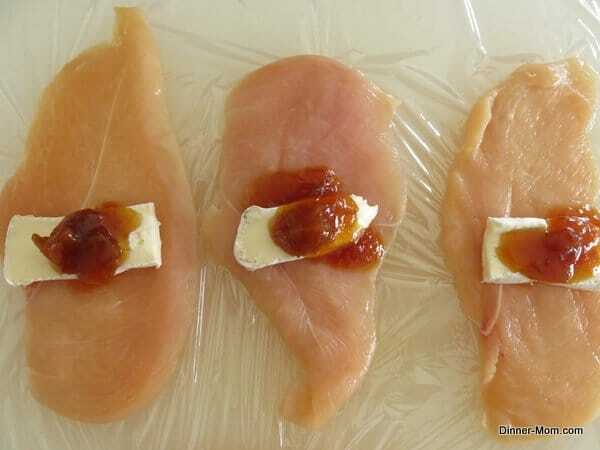 Place a slice of brie in the center of each piece of chicken. Place a heaping teaspoon of mango chutney on top of the brie. Carefully roll the chicken, keeping the brie in the center of the roll. 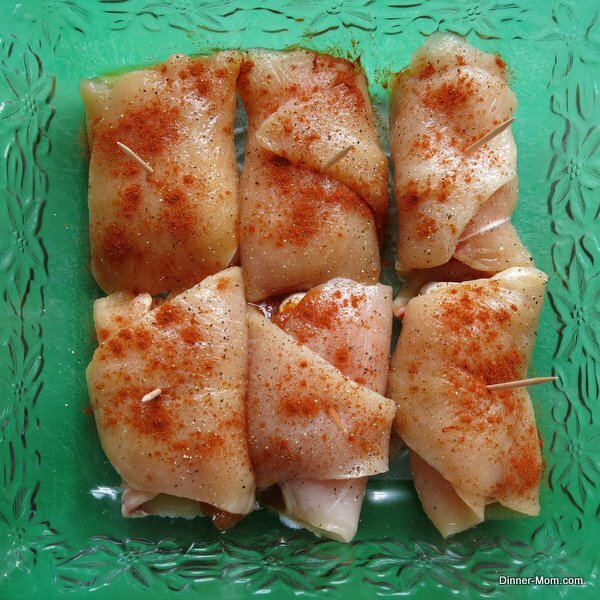 Place chicken roulades in a baking dish. Bake, uncovered, for about 25 minutes or until the chicken is no longer pink. Spoon excess juices that ooze out of the chicken over the chicken and serve with additional mango chutney on the side, if desired. Buying chicken cutlets saves you from pounding chicken to the desired thickness. The rind on the brie is edible and blends with the mango chutney during the cook process. But, you can cut it off. It's easiest to work with brie when it is cold. Lovely, must try this very soon. Thanks for sharing. Your welcome and thanks for stopping by. Love your article on the health benefits of mango! Saw these on G+ and had to come over to say they look magnificent!! What a fabulous way to change-up my weeknight dinners! I often do chicken breast, but have never rolled them like this. Can’t wait to try it. Mango chutney makes everything better! I love the simplicity of this dish, too. Popping over to tell you how much we loved this and say hi. We used to make them at your store!